There's growing concern that the glowing screens of laptops and the iPad may affect sleep if used right before bedtime. (CNN) -- J.D. Moyer decided recently to conduct a little experiment with artificial light and his sleep cycle. The sleep-deprived Oakland, California, resident had read that strong light -- whether it's beaming down from the sun or up from the screens of personal electronics -- can reset a person's internal sleep clock. It worked. Instead of falling asleep at midnight, Moyer's head was hitting the pillow as early as 9 p.m. He felt so well-rested during the test, he said, that friends remarked on his unexpected morning perkiness. Moyer may be onto something. More than ever, consumer electronics -- particularly laptops, smartphones and Apple's new iPad -- are shining bright light into our eyes until just moments before we doze off. Now there's growing concern that these glowing gadgets may actually fool our brains into thinking it's daytime. Exposure can disturb sleep patterns and exacerbate insomnia, some sleep researchers said in interviews. "Potentially, yes, if you're using [the iPad or a laptop] close to bedtime ... that light can be sufficiently stimulating to the brain to make it more awake and delay your ability to sleep," said Phyllis Zee, a neuroscience professor at Northwestern University and director of the school's Center for Sleep & Circadian Biology. "And I think more importantly, it could also be sufficient to affect your circadian rhythm. This is the clock in your brain that determines when you sleep and when you wake up." Such concerns are not entirely new: One sleep researcher said Thomas Edison created these problems when he invented the light bulb. But they've been revived by the popularity of Apple's new slate computer, the iPad, which many consumers say is good for reading at night in bed, when the brain thinks the environment should be dark. Unlike paper books or e-book readers like the Amazon Kindle, which does not emit its own light, the iPad's screen shines light directly into the reader's eyes from a relatively close distance. "I wish people would just take a boring book -- an old-fashioned book -- and [read] by a lamp. Make sure that it's not too bright -- just so you can read," said Alon Avidan, associate director of the Sleep Disorders Center at UCLA. "And if they do that, I think they'll feel a lot better and they'll be able to relax." These concerns stem from the fact that people are biologically wired to be awake when the sun is out. When receptors in our eyes are hit with bright light for an extended period of time, they send a message to the brain saying it's time to be awake. The brain, in turn, stops secreting a hormone called melatonin, which makes people sleepy and helps regulate the internal sleep clock. Normally, our brains start giving us that hormonal sleep aid at about 9 or 10 p.m. But if bright lights are shining in our eyes, that may not happen as planned. That's what worries some sleep researchers. To make matters worse, our eyes are particularly sensitive to blue light, which is common during the day, but is less so in the evening. 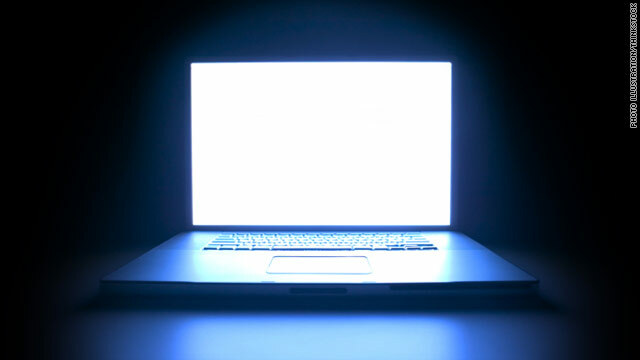 The fact that computer screens and phones tend to put out a lot of blue light could intensify the screen's awakening effects, even if the light isn't all that bright. There's no exact formula for determining how much light is needed to reset a person's internal clock. Several factors are at play, including how bright the light is, what hues are present, how large the light source is, how far it is from the person's eyes and what that person tends to do during the day. A farmer who is exposed to sunlight all day long would likely be less sensitive to artificial light at night than a person who works in a dimmer office environment, said Mariana Figueiro, an assistant professor and director of the Lighting Research Center at Rensselaer Polytechnic Institute in Troy, New York. While there has been research to show that light -- even artificial light -- can affect human melatonin production, no research has been done specifically on whether the iPad and laptops disrupt sleep cycles. Some researchers are skeptical of the link. "I don't think it's an area of concern. I think it's an area of personal preference," said Mary Lou Jackson, director of vision rehabilitation at the Massachusetts Eye and Ear Infirmary, which is affiliated with Harvard Medical School. People shouldn't be concerned about reading on backlit electronic devices at night unless they're experiencing insomnia, in which case they should dim the screen, Jackson said. Several iPad owners contacted by CNN said they enjoy reading on the device before bed and haven't noticed sleep problems. George Brainard, director of the Light Research Program at Thomas Jefferson University in Philadelphia, Pennsylvania, said it's more important for people to turn off their computers and gadgets at night -- so they have a dark sleeping environment -- than to worry about reading in bright conditions before bed. Electronics with glowing screens may create problems for people who are susceptible to insomnia, he said, but that research hasn't shown the link yet. "Can we jump from [the available research] to an iPad? Not quite yet," he said. "But you can begin to see the potential is there for low levels of light to potentially have a biological effect." Avidian, from UCLA, said several factors play into how well a person sleeps. It's possible iPads and laptops, when used late at night, may delay sleep because they require more focus and provide more potential distractions than books, he said. Still, the possible relationship between reading at night on backlit screens and insomnia has led some sleep doctors to prescribe zany solutions for patients. Figueiro, the professor at RPI, prescribes sunglasses with orange lenses. "Wearing these orange glasses definitely will take away any of the [blue] light that the circadian system is sensitive to," she said. "Your circadian system would basically be blind." Zee, the Northwestern doctor, said she has recommended the same. She also says people who have trouble sleeping should keep iPads and laptops out of the bedroom. It's best to stop using them one or two hours before going to bed, she said. Changing your computer or iPad's screen settings to make the display dimmer or take blue hues out of the display at night may also help, researchers said. A free, downloadable program called F.lux will automatically adjust the hues on your computer screen to eliminate blues when the sun starts setting -- and then replace them when it rises again. The program, which was developed by a computer programmer and an artist, is not scientific. Sleep researchers said they are unsure of its actual impact. Moyer, the Oakland resident who turned off all of his gadgets and lights at sundown for a month in 2009, said he hasn't kept up the rigid routine. But he has applied some lessons from his lights-off-at-night experiment. For one, he uses the computer less at night. And when he needs to use it, he employs F.lux to make the screen more red and less blue. He says he's happier and more rested for it.